5 Things To Consider When Building A Solar Powered Home #SolarPower « Adafruit Industries – Makers, hackers, artists, designers and engineers! Powering your home using solar energy does require more maintenance than using the regular old grid power. But not much. Solar panels have no moving parts. They are part of a completely stationary system. So once they’re installed, there’s not a whole lot that can go wrong. Pretty much the only thing a homeowner needs to do is keep the panels clean. It’s an important task, though — too much dust and bird droppings on the panels can reduce the amount of sunlight striking them. Dust buildup can reduce the amount of electricity produced by the system by as much as 7 percent [source: CalFinder]. This type of maintenance is not something that needs to be done once a week, though. You’d probably only have to hose the panels down anywhere from one to four times a year [source: CalFinder]. You don’t need to get on the roof. A hose and nozzle from ground level works fine. If there’s construction in your area, you may have to clean the panels more often to avoid the extra buildup of construction-dust residue. Aside from that, you’re just looking at occasional check-ups to make sure all parts are in working order. You may eventually have to have the inverter replaced (and the batteries if you have a battery-storage system), but that’s a once-a-decade type of maintenance event. 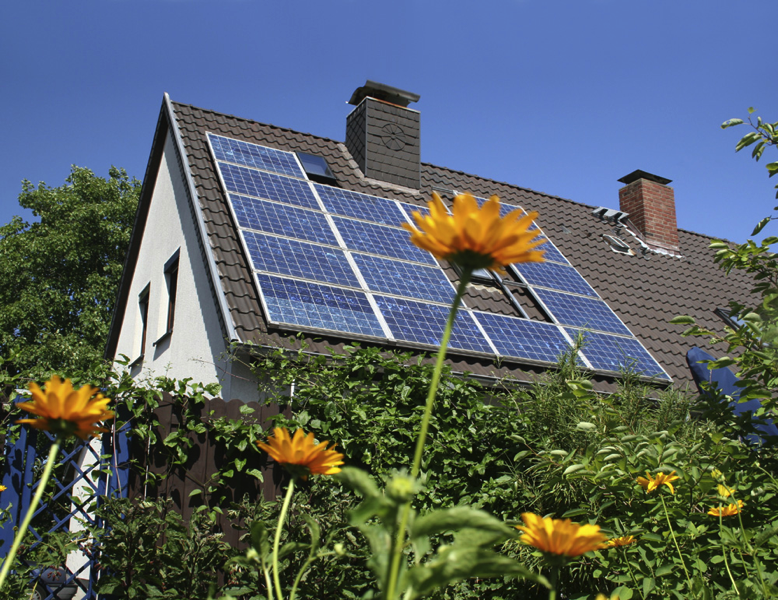 Where your home is situated has a big effect on your solar-power efficiency. It’s an obvious concern: If your electrical-power generation depends on sunlight, things like towering shade trees and tall, shadow-casting buildings are going to be a problem. It’s an even bigger problem than some people realize, though. Different types of panels react differently to shade. While a poly-crystalline panel will substantially reduce its output if any part of the panel is shaded, a mono-crystalline panel will stop producing electricity entirely. Rating Sunlight is obviously key when it comes to solar power, and not all regions are created equal in this regard. It’s important to know how much sunlight reaches ground level in the area where your potential solar house is located. What we’re talking about here is insolation — a measure of how much solar radiation hits the ground in any given area in a specified time period. It’s typically measured in kWh/m2/day, and it tells you how much sunlight will be available for your solar panels to turn into electricity. The higher the insolation value of your location, the more electricity each of your panels will be able to generate. A high insolation value means you can get more power out of fewer panels. A low insolation value means you could end up spending more to achieve the same power output (more on expenses later). If you live in a place like Phoenix, Ariz., or Albuquerque, N.M., you’re golden. They’ve got super high insolation ratings, 6.58 and 6.77, respectively [source: CleanBeta]. This means in Albuquerque, 6.77 kWh worth of sunlight falls on each square meter of Earth in the course of one day (on average). In Portland, Maine, on the other hand, one square meter of land receives 4.51 kWh worth of sunlight in a day [source: CleanBeta]. And Chicago sees just 3.14 kWh/m2/day [source: CleanBeta]. Does that mean you have to build your solar-powered home in the Southwest instead of the Midwest? Not at all. It just means that in Chicago, a solar setup is going to be less efficient than a similar setup in Albuquerque. You’re probably going to need more panels to achieve the same power output. Contrary to what most people think, the size of a solar-power installation has nothing to do with the size of the house it’s powering. Instead, it’s all about two things: insolation, which we just discussed, and how much power you need. If you live in Albuquerque and you don’t use much power, you need a smaller system. If you live in Chicago and run a circa-1980 electric furnace all day every day, you’re looking at a lot more panels on your roof. To get a very rough estimate of how big a system you need, look at your electric bill and figure out how many kWh you use per day. The average home in the United States uses about 900 kWh every month, or about 30 kWh per day [source: DOE]. Multiply that by 0.25 [source: GE]. We come up with 7.5, so we need a 7.5 kW system. In 1956, solar panels ran about $300 per watt [source: Southface]. A 7.5-kW system would have been out of the question for all but the shockingly rich. Today, prices are down considerably. In most areas, solar arrays run about $7 to $10 per watt. You’ll be paying closer to $7 if you install it yourself, and closer to $10 if you have a professional do it. For a 7.5-kW array, or 7,500 watts, you could pay anywhere from $50,000 to $75,000 dollars. If you need less electricity, of course, the number gets lower. If you only consume 600 kWh in a month, or 20kWh/day, you could supply all the energy you need with a 5-kW system. That would cost closer to $40,000. Thousands of dollars in tax credits do bring the cost down considerably — in New Jersey, for instance, homeowners buying a $50,000 system will get $12,500 back from the state on top of the $11,000 federal rebate. So in New Jersey, that system would end up costing $26,500. Of course, it’s not an all-or-nothing arrangement. You can always partially power your house using solar. If you want to invest in a $10,000 solar array, you can supplement grid energy with a 1.5-kW solar system. Still, tens of thousands of dollars for a solar array is still pretty cost-prohibitive — especially since it can take decades to make that money back in energy savings [source: WeatherImagery]. Along those lines, a recent development in the solar-power industry puts solar panels within reach of those who don’t have thousands of dollars to spend on clean energy. There are companies now across the country that rent out solar panels. There’s no upfront charge. Homeowners pay a monthly rental fee to use the panels, and the rental company owns and maintains them. This could remove the huge cost consideration from the equation. $7-10 dollars per watt is so last year. :). Most California roof installs are under $4.00/watt and heading down.